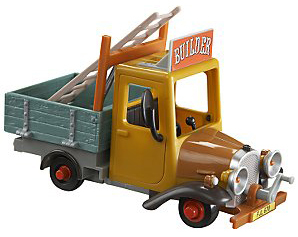 Character Option’s version of Ted Glen’s Truck is in a smaller scale than the ER friction version. As with the other Character vehicles, pressing the button on the top of the cab plays the SDS Postman Pat theme tune and other sound effects. Ted’s Truck comes with a ladder, opening doors and windable starter handle.